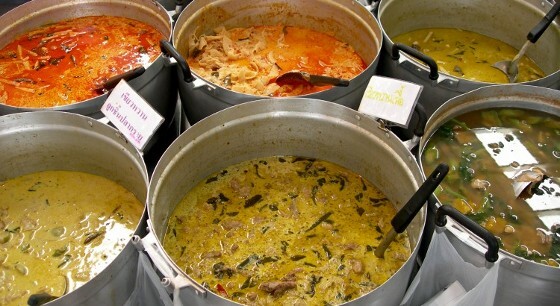 Looking for the best and most authentic places to eat in Bangkok? Being a foreigner, sometimes restaurants will tone-down the food a bit, or sell more foreign-friendly food. If you’re looking for the real-deal, try some of these places. 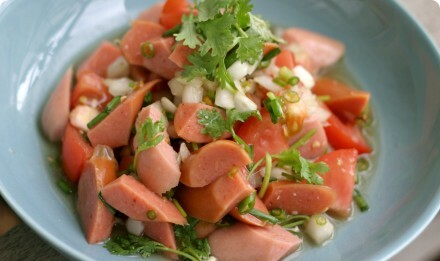 Also, most street food will be made the same for everyone, so feel free to try that as well. Ignore the guide books which warn you of the dangers – we’ve never been sick from street food! Baan Klang Naam (House Surrounded by Water) is an excellent place for Chinese/Thai seafood. It’s a bit pricey but worth it! Dishes we recommend: Crab stir fried with curry powder (puu pad pong garee – ปูผัดผงกะหรี่), Mixed seafood “tom yum” (tom yum po taek – ต้มยำโป๊ะแตก), Steamed Fish in Red Curry (hor mok plaa – ห่อหมกปลา). Their curries are good as well. Their mango/sticky rice is always a good desert if you’ve saved room. This restaurant has been getting more “touristy” as of late, however as far as I know their food has not gone downhill. Just ignore the other farang and order away. 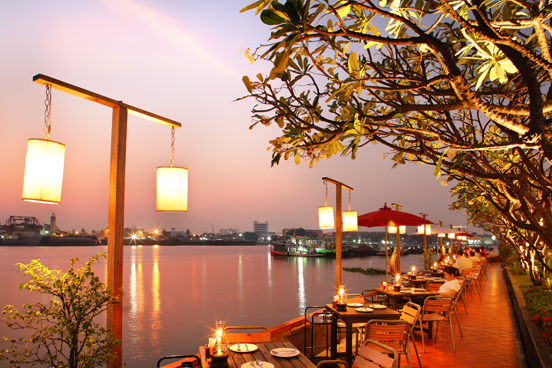 If you have to choose between one of the riverside restaurants, this would be our recommendation. Sometimes the service can be terrible here, and it’s quite LOUD when the band plays, but the food is decent and it’s right on the water. It’s a nice place to go and relax. You may want to call ahead to get a waterfront table. Stick to their Thai menu. They’re only open for dinner. Aw Taw Gaw Farmers’ Market – ตลาด อ.ต.ก. Amazing and beautiful food market. If you’re going to go to one place on this list, make it this one! This place has a sign in English called “Banana Family Park”. It’s a health center of sorts, with yoga, a gym, classes, a library, meditation, a coffee shop and a line of vegetarian food stalls. Note that most of the food stalls are “jae”, meaning vegan and no garlic & onion. 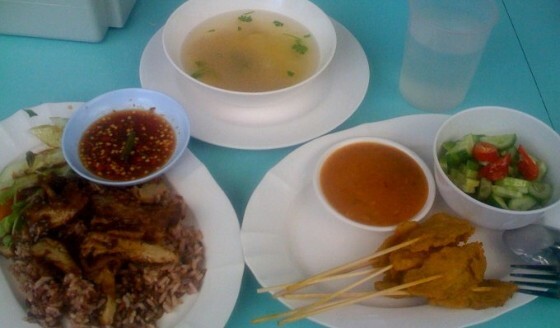 This is a great place to get vegetarian food in Bangkok. The plates are 20-40b each so it’s very affordable. My favorite vendors are the first vendor as you come in from the Soi Aree 1 entrance (“chicken” rice, “duck” on rice, noodle soups), the “chicken” satay (two vendors down), and the lady down around the corner who sells “khao soi” and noodle soup. The ready-made tray food is mediocre. It’s only open until maybe 1pm and most vendors sell out early (11am?) so get there early. Note that seating is all outside but covered so you won’t get wet if it rains. 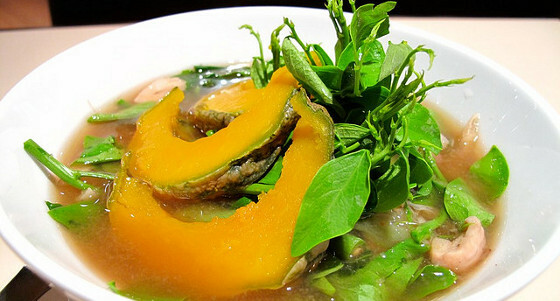 All the food is organic and vegetarian at this restaurant – they have their own farm in Rachaburi. Not open on Wednesdays. This place is very healthy. This is the Bangkok branch of their famous Chiang Mai restaurant. They serve delicious Northern Thai food here, all vegetarian, and I believe mostly organic. A great place if you’re looking for a sit-down restaurant with air conditioning. It’s eerily quiet and kind of hidden downstairs of this office type building, but worth the odd atmosphere of the building for the food. Please note: Double check that the restaurants are still there or are open before going. Also note that all street food is closed on Mondays due to “clean up day”.